I just read a snippet in the news that made my morning. A 82-year-old retired man named Anthony Cymerys keeps his skills, wits and love for people intact on the daily by offering haircuts to the homeless people or others who might be in a slump in Hartford, CT. He pops a lawn chair up at Bushnell Park and 'customers' fill park benches waiting for their turn. Price? A hug. Why was this compelling to me? Because I love stories with good endings. I envision this man as one who holds the door open for others, says hello to strangers, gives a hurried person his place in line. I also like that his courtesy and generosity extend to a population of people that might not be recipients of courtesy and generosity as frequently as other people OR as often as they need it. This story is very simple and it reminded me how easy it is to embrace and execute on the simple concept of giving a damn about others. I read numerous other tidbits of goodness like 1. a rookie Wildlife officer saves a baby fawn from a river or how a 10-year-old girl opted for donations in lieu of birthday gifts to buy a police dog a bulletproof vest. And how a dying soldier in NC was surprised by over 40 individuals who showed up to help his family move. And how Allyson Ahlstrom started Threads for Teens as a 14-year-old and now, at age 18, took her boutique on the road via a giant moving truck. What is the purpose? To give free head-to-toe outfits to teenage girls in need. Awesome. So many people are inherently good and one of the components that connects all of these individuals together is that simple concept of giving a damn about others. Every holiday season, we compile a list and then take MiniMac to do acts of service for others. These posts have motivated me to kick that into October this year so we will plan some activities for the week to come. The truth is, we can do kind things everyday. 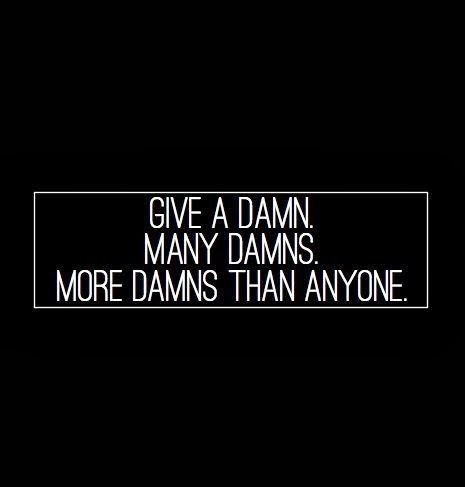 Go give a damn. Shine your light. I know you will do something great. That's a great value to instill in your child. I think we all feel a sense of fulfillment in doing things to help others. It's interesting that the holiday season brings that out in us more than any other time of the year. It's so great to hear stories of people being kind. It's so rare these days. I would rather hear about stories like these than hear the news anyway. Thank you!!! Very inspiring. The wheels are now spinning in my head as to how I can do more. We need constant reminders so that the giving will continue. Thank you. 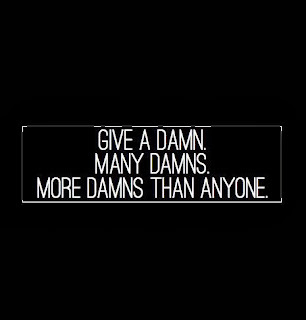 Love in action..."giving a damn". I own a lot of T shirts but never could force myself to own that one. I love this...It's good to read considering that I am often SUPER annoyed and generally pissed off because I see people being so damned inconsiderate. So this is a good reminder...and a good push to make me think about what I can do instead of griping about how mean people are.